There's still time to make that discovery that could change everything. CLEVELAND -- What if you had a disease and no one was looking for a cure? Something so rare the big pharmaceutical companies wouldn’t make money because too few people were affected? There is a research lab in Cleveland committed to finding treatments and cures for those types of genetic diseases, giving hope to patients and their families. 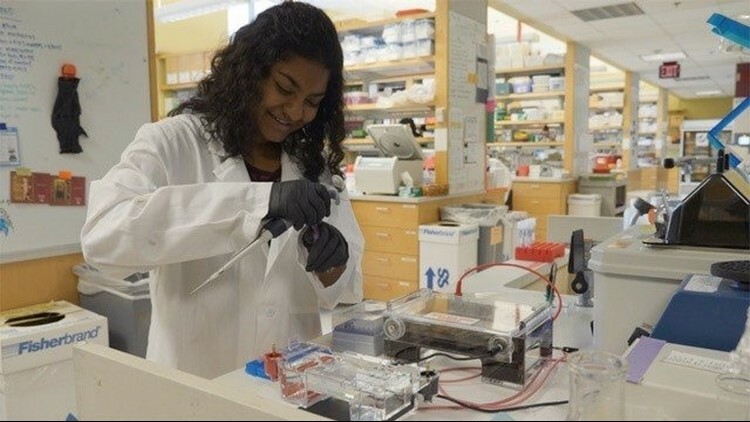 A recent high school graduate is helping to find a cure for herself. Anjali Prabhakaran is like any other teenager. "I like music. I like to sing along with my friends. I also like to cook and garden. Just make things," Anjali said. But every few hours, she has to stop doing the things she enjoys to manage a rare genetic liver disease. It's called Glycogen Storage Disease Type 1A and it interferes with the way the body turns food into energy. "My liver is missing an enzyme that can't break down that glycogen and release that energy. Which means that I always have to have something in my stomach," Anjali said. That includes, what Anjali calls, cornstarch shakes. They help maintain normal blood sugar levels - between meals. She must drink them during the night, too. If her blood sugar drops too low, she could lose consciousness, or have a seizure. "When she was growing she would always ask us like, when will I get cured? When will I get cured? And we always say maybe another five years, maybe another 10 years,” said Radhai Prabhakaran, Anjali’s mother. Or maybe sooner, advances in the human genome and rapid drug testing is speeding up research. What once took years, now takes only weeks to discover. That's the approach the Research Institute of Children's Health at CASE Western Reserve School of Medicine is pioneering. We are trying every compound, every drug we can to see if it will change the disease process. Once we find one that works we work backwards to try to understand how," said Dr.
Mitch Drumm, founder of the Researcher Institute of Children's Health. Some of the brightest minds in college, and even high school are helping with research. Among them, Anjali Prabhakaran, who may just find the best treatment for her own disease. "I was excited because I could finally felt like I could do something about it," Anjali said. "Watching her with her excitement about what she is doing brings a motivation to the lab," Drumm added. Anjali continues to successfully manage her disease, with her parents close by to back her up. That's about to change when Anjali heads off to Ohio State. "I want there to become a time were I'm completely independent. And it is doable, but it is very, very difficult. Especially at night there is always a danger I will forget. I will just sleep through it and I won't wake up in the morning," said Anjali. "Obviously I want a cure. Even if I don’t get a cure, it’s possible we could find a treatment to help make my shakes last longer. Or something to make sure my blood sugar doesn’t drop as low. So it is just endless possibilities,” said Anjali. The drugs the Research Institute for Children’s Health is testing have already been FDA approved for other uses. So when they find a breakthrough, the treatment can get patients even faster. And another interesting note, Anjali’s career goal is to study environmental policy, and go to law school.